RhineBuzz: Galliano at the düsseldorf festival! 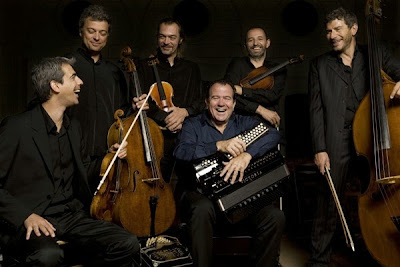 As he played the very first note, the smile in Richard Galliano’s face began to be noticeable. Although he had a sold out venue and created a concert that earned him a long lasting standing ovation, what really drew us was that smile, the joy of once again making music. For those of you who were there and didn’t see it, maybe you were too distracted by his fashionable red shoes? It didn’t matter that he was playing music by two composers who lived around 250 years apart from each other. These very demanding pieces sounded completely effortless and uncomplicated on his accordion. Playing pieces that are not even original for that kind of ensemble. Galliano was living every phrase and playing them with an astonishing artistry and sensibility. The concert of Galliano and his quintet, last Monday September 23, where he played music by Antonio Vivaldi and Astor Piazzolla, was one of those somewhat rare opportunities were you can actually be part of the creation of music. The listener was treated to a masterfully and really creative contemporary interpretation of a so called “classic”. Regardless of your occupation and professional background, he made sure you felt immersed in this new musical dimension. We should learn what his smile is all about: he enjoys his concerts possibly even more than his audience and shares in a very contagious manner this feeling with everyone. Thank you RhineBuzz for the opportunity to witness this amazing performance, and for Galliano and the incredible düsseldorf festival!